But as a matter of fact, books are the ultimate source of knowledge, through which a person and collectively a nation can gain everything it desires for. Books are the food for mind, that not only help the mind to function properly, but also let the person think in the positive way. Despite of the fact that books are the best friends indeed, they make a person, civilized, noble and enlighten the world. There are number of personalities from the past that we idealize and the reason behind this fact is only their lives – because of the books. So, if you want to get an inspiration from these men and want your life full of knowledge and immortal, then having a book tattoo on your body is not a bad idea. As tattooing is the form of self- expression for life time, you can express yourself in a very positive way. If you love books and want to get expressed with something extraordinary, then why not get a design of the book engraved on your body? Here are some of the interesting book tattoos, that you would love to get to embellish your body. 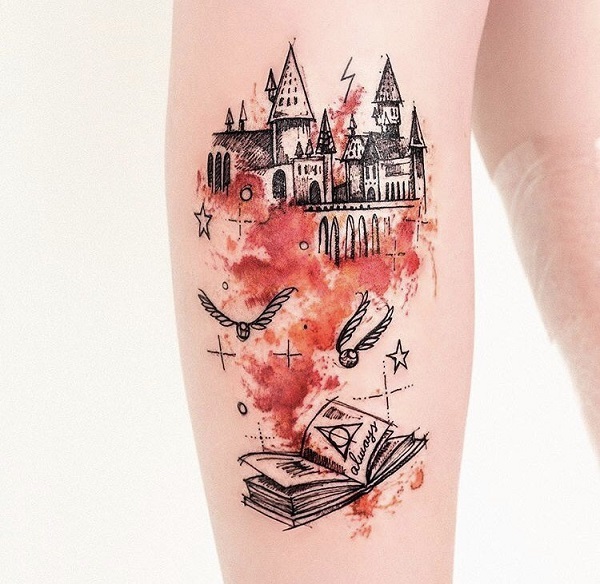 If you are bookworm and want to show it to the world, then check out our best picks of the book tattoo designs, that you can have on your body too. The Water Colored Book. Get your arm embellished with this amazing water colored book, that seemed to be sparkling with the shine of knowledge. 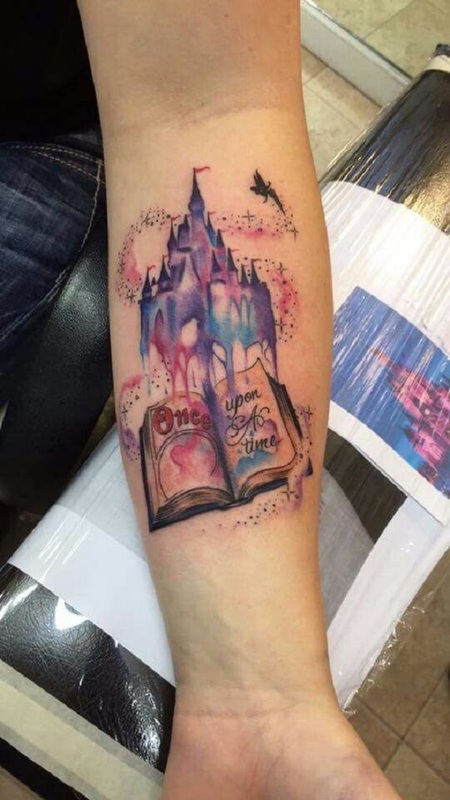 A Fairy tale book tattoo. Who don’t want a fairy tale in life? 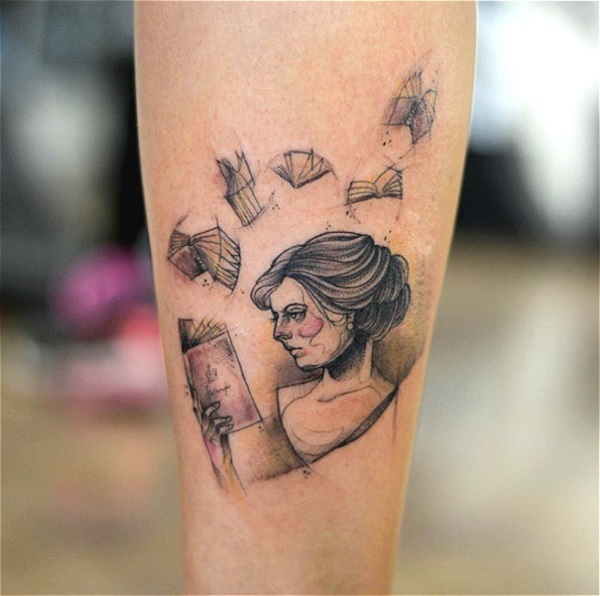 If you are among the fairy tale kind of a person, then this book tattoo is the best to try out. Books becoming Birds. 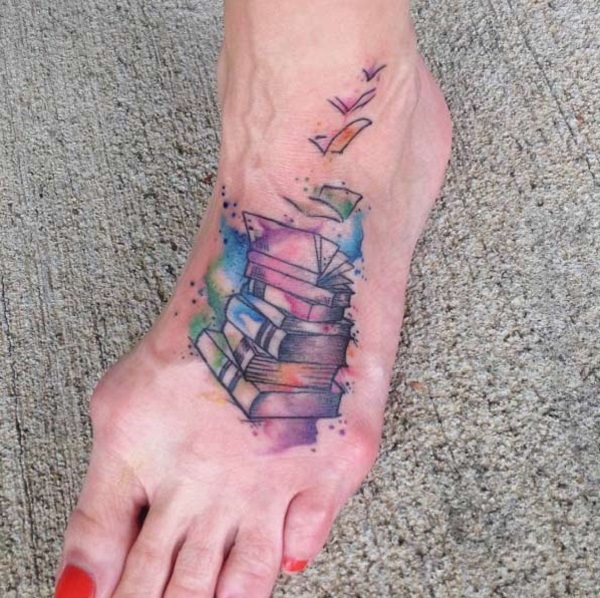 The colorful tattoo of stack of books, that are gradually becoming birds is another inspiration for all the people who want to fly in heights while reading the books. A Feather writing Book Tattoo Design. Next book tattoo on the list is the one in which a beautiful feather is writing a book. This tattoo is a great mix of art and colors and would look great on your back too. Flower Growing in Book. 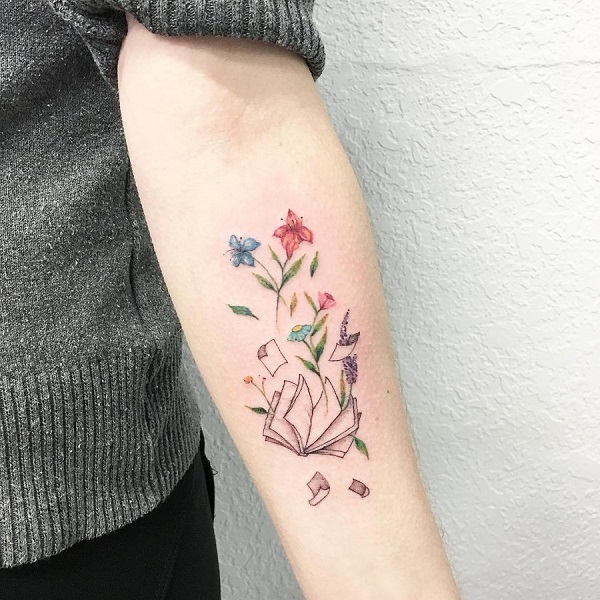 As mentioned above, books enlighten the world and make everything grow, the same is described in the above book tattoo design in which the book helps the flower to grow. 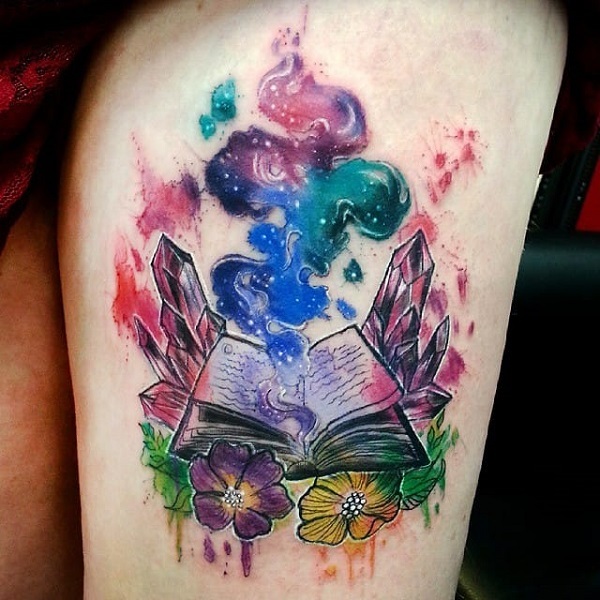 Magical Book Tattoo Design. 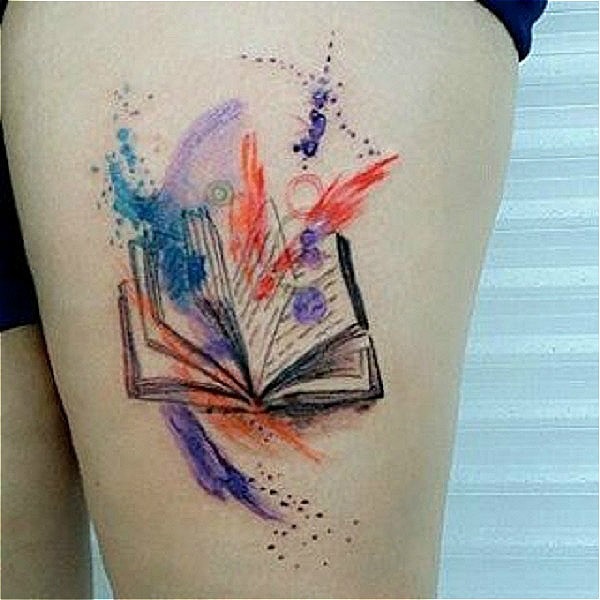 Magical book tattoo design is inspiration for all those people who believes in magic. 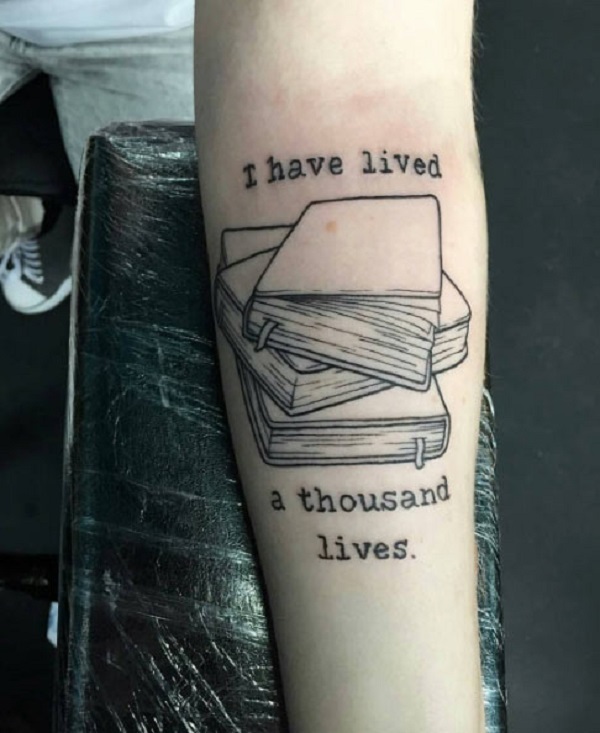 Tearing Book Tattoo. The next tattoo design depicts the tearing book with the great play of colors. You can have this tattoo on your arm too, for amazing creativity. Book under the Blue Sky. 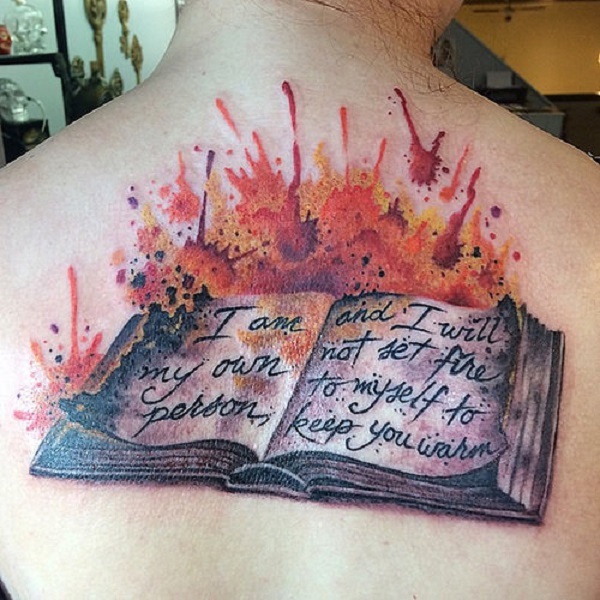 Another amazing book tattoo design is next on our list. The book is shown lying under the blue sky and moon with the paper air plane flying. Stack of Books with the Cup of Tea. 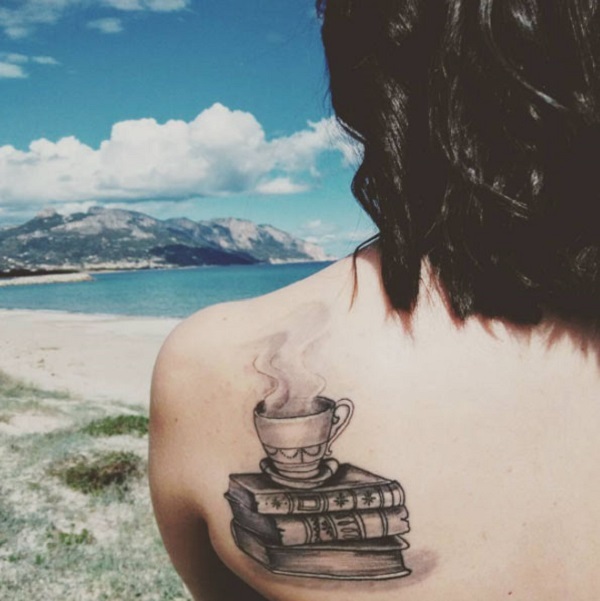 For all the novel lovers who loves to drink tea while reading, this tattoo is the inspiration. Flying colors out of the Book. 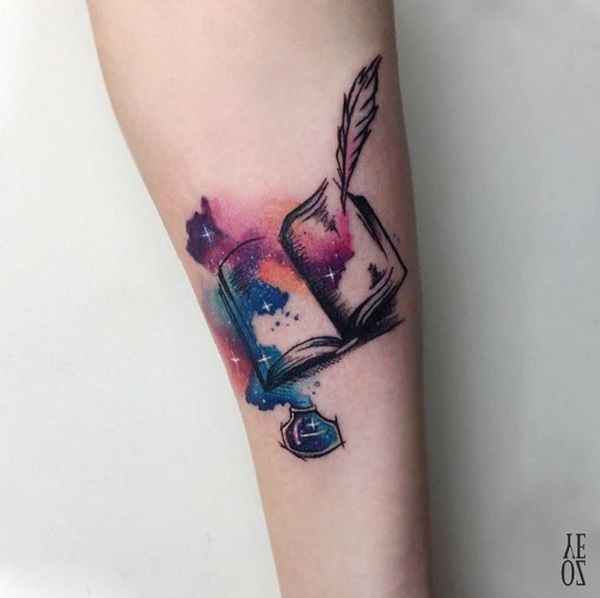 The beautiful combination of colors flying out of the book tattoo, is what you need to have on your arm. Books with Origami Bids. The true art lovers would definitely love this tattoo. 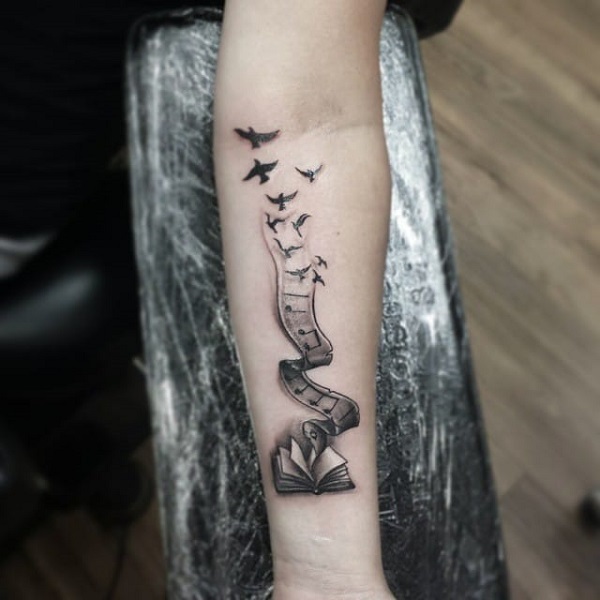 The tattoo depicts the art of paper birds combined with the books, that makes a great piece of tattoo to try. Another Fairy Tale Book with flying Colors. Another worth trying book tattoo design is the fairy tale book with the flying colors and birds all around. Book with Flying Pages. 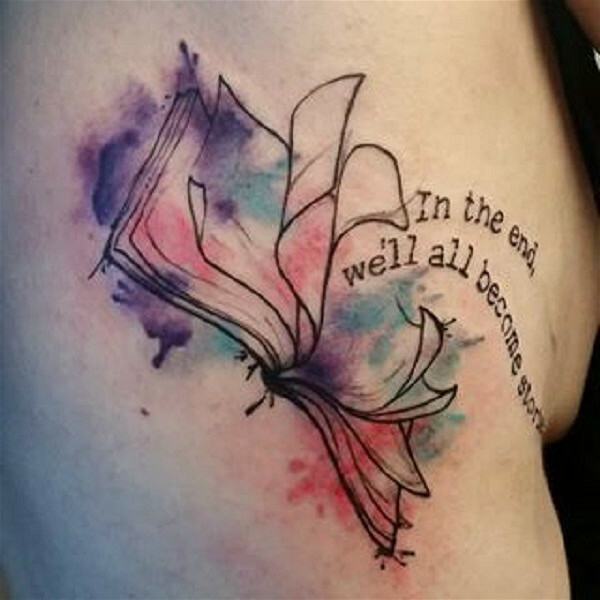 This one is another great book tattoo design to try that shows the book with the flying pages and colors. You can add anything to this tattoo according to your needs and requirements. Library on the Back with Girl. If you are a book worm and want to get motivated all the time, then this piece of art is worth considering. 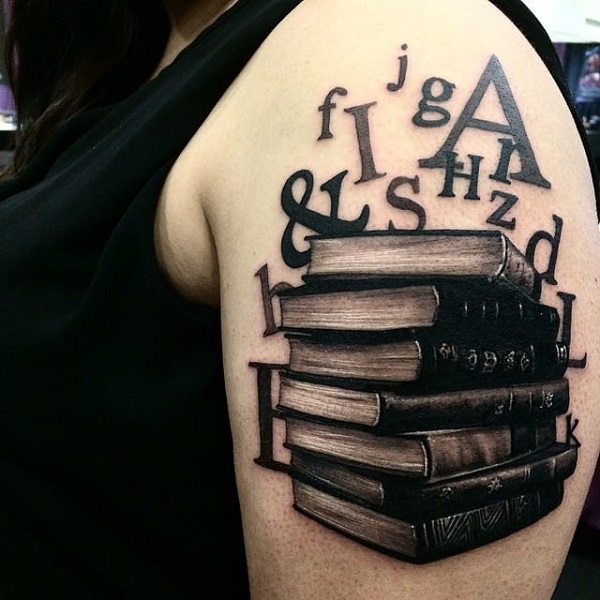 This tattoo depicts the library with the girl standing in front of the book shelf and picking a book to read. I’ve Live a Thousand Lives Tattoo. You might heard of this amazing quote by George R. R. Martin and this quote indeed shows the importance of books. This colorful stack of books. 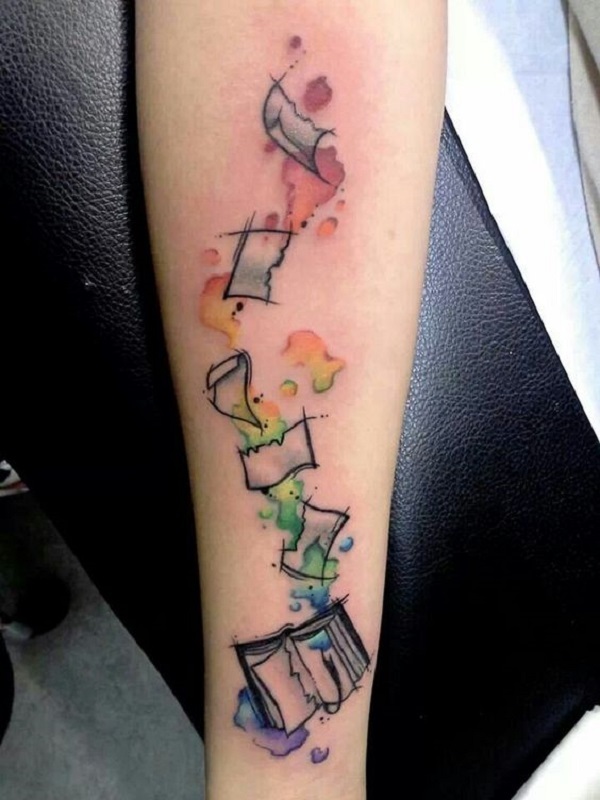 Another amazing book tattoo design on the list is the colorful stack of books, with the alphabets flying. The black and white Tree growing from Books. 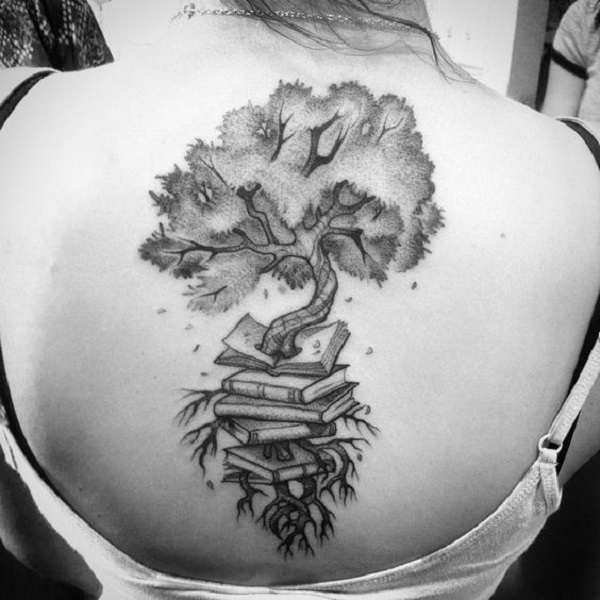 This tree growing from within the stack of books is another amazing worth trying book tattoo design for all the tattoo lovers out there. 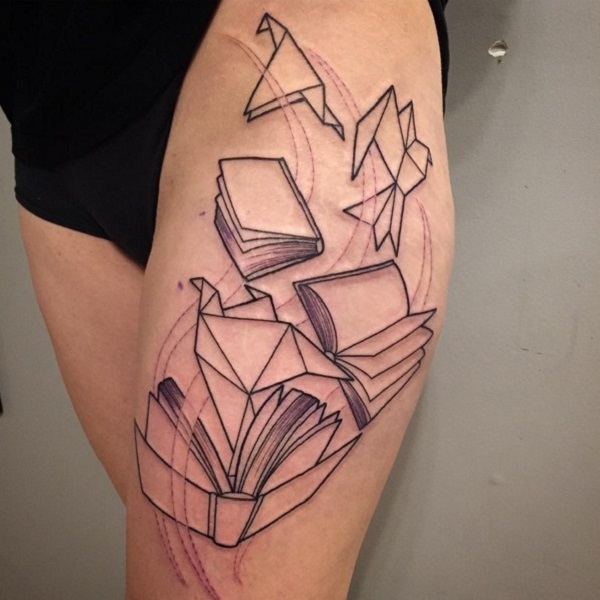 Book pages becoming Birds Tattoo. Books make you immortal. 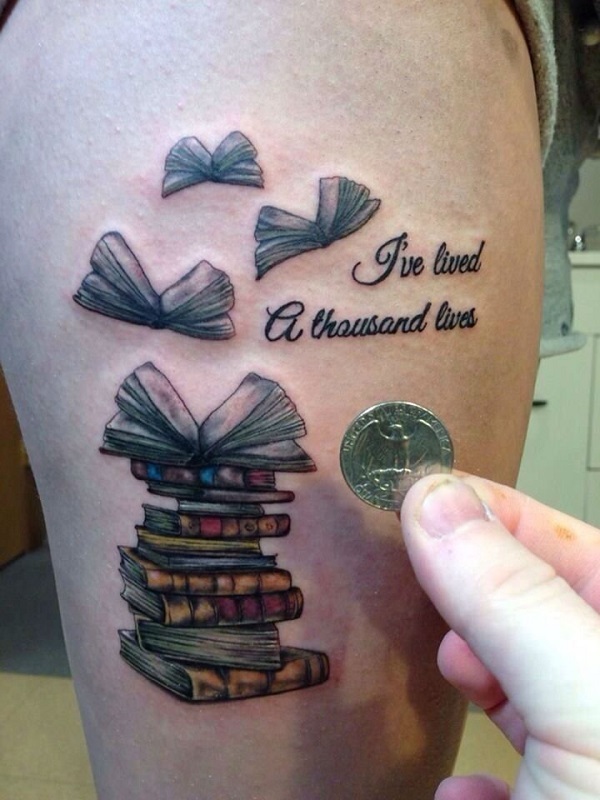 And this amazing book tattoo design is the best depiction of what’s said right. The Flying colors out of book with Flowers. If you want something colorful and meaningful, then this tattoo coupled with the amazing colors and flowers is what you need to have. In the End we’ll all become stories. This tattoo is symbolizing the bitter truth of life – the Death. So, if you want to remain motivated and want to do something before your life ends, this tattoo is the inspiration. 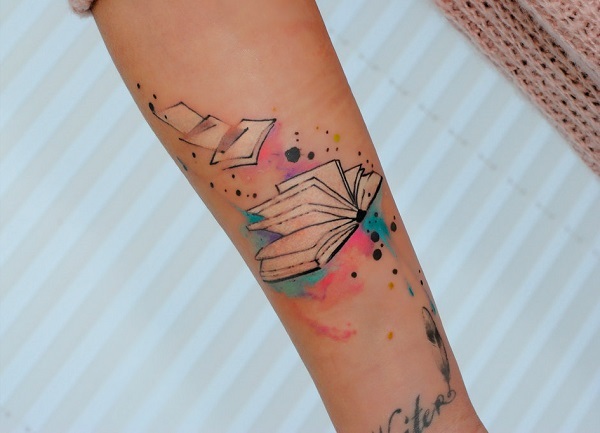 The Colored Book Tattoo with torn pages. 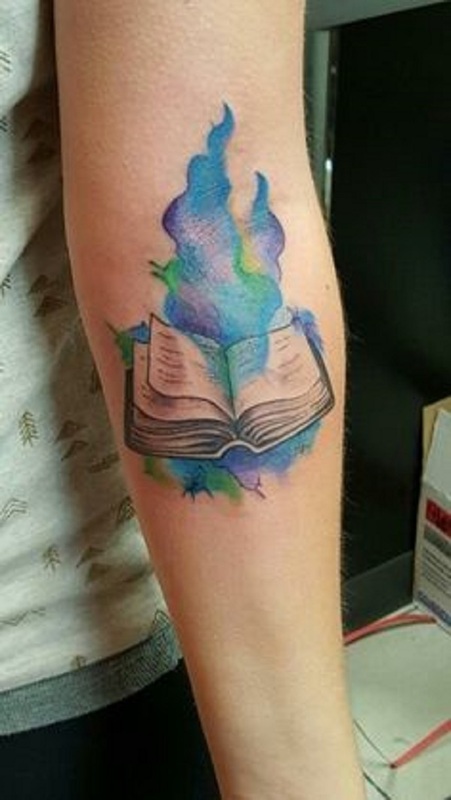 The colored book tattoo is worth trying as it incorporates the combination of colors along with the open book. The pages of the book are torn and are flying in the air. Gray-scaled Books with Tea Tattoo. A cup of tea is always considered to be the best combination for reading. If you also love to read while taking tea, then this tattoo is worth considering. 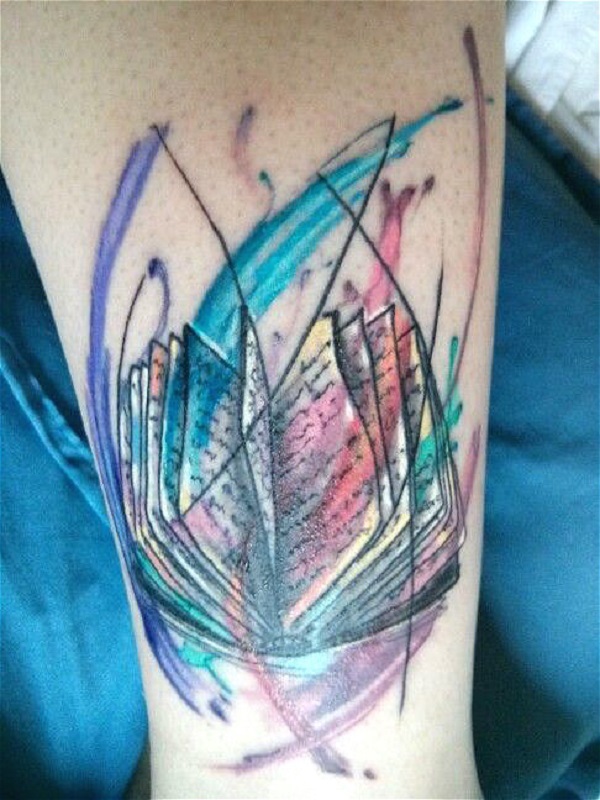 This colorful Art of book tattoo. 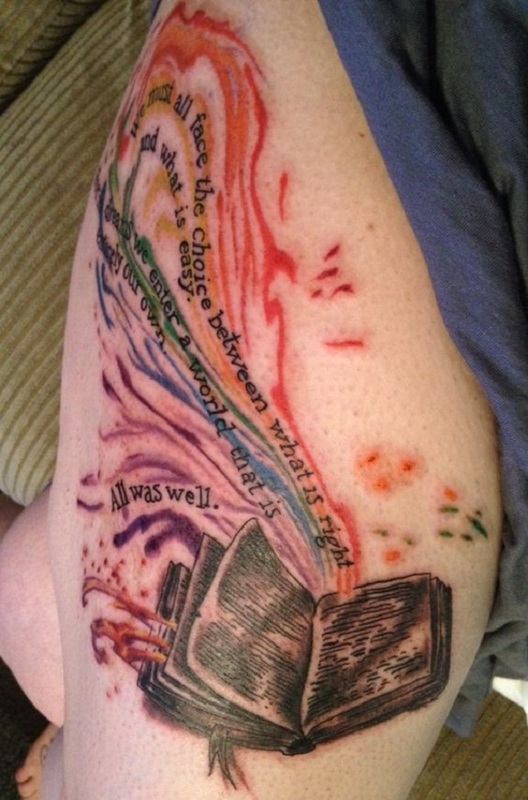 Array of colors coming out of the real- time book tattoo is worth considering, if you are a literary kind of a person. The levitating letters. 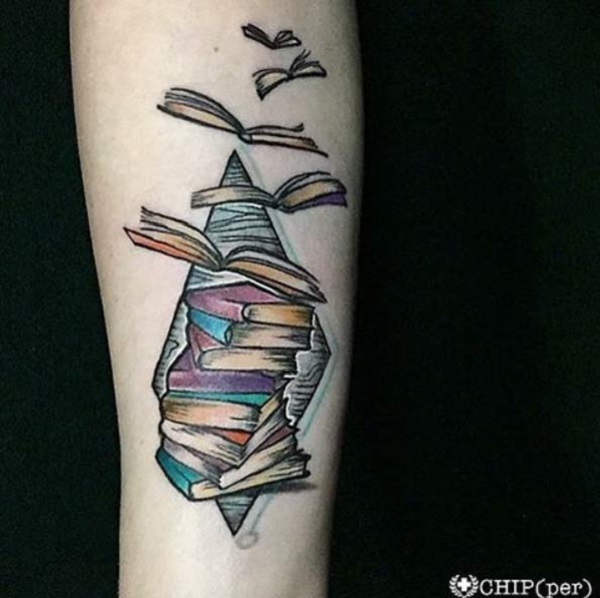 This 3D tattoo of books with the levitating letters is the great option for all those book worms who thinks “Knowledge is Power”. 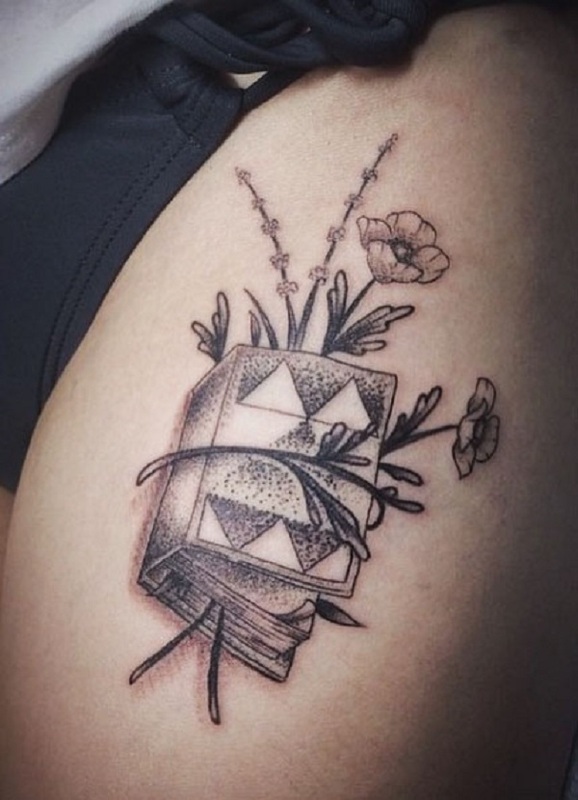 This naturalistic Book tattoo design. If you are a nature lover as well as that of the books, then this naturalistic book tattoo design is worth giving a shot. Tea Time. A cup of tea lying on the stack of books is the one to try, if you are looking for something simple yet effective. Watercolor Work. 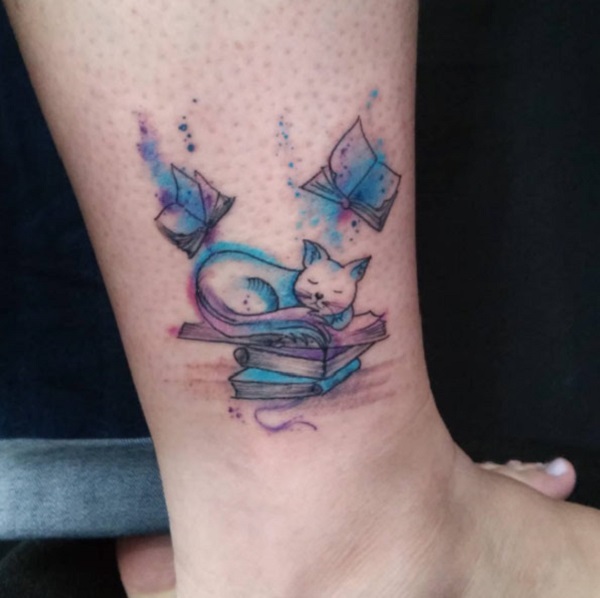 The next tattoo on the list is the cat sleeping on the books. 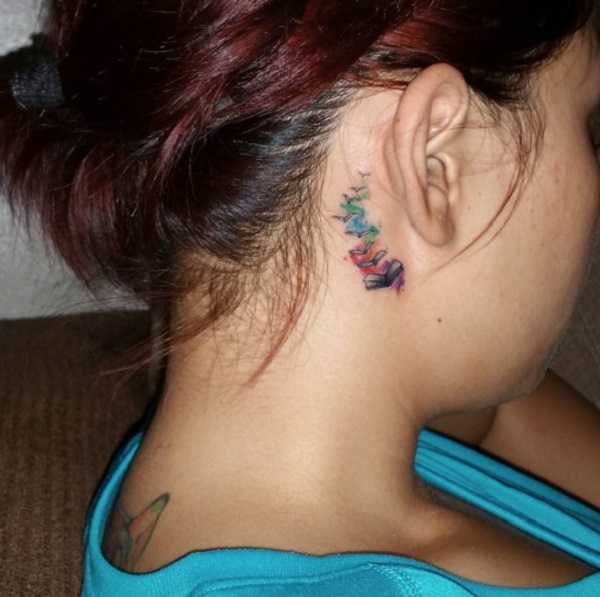 The tattoo is made with the beautiful play of water colors, to add creativity to it. Water colored Stack of Books on Foot. If you are looking for a tattoo design for your foot, then this amazing water colored piece is made right for you. The dot work book tattoo design. The dot work tattoos are always in the fashion. This dot work book tattoo design engraved on the arm would definitely add something to your personality. The colorful Stack of Books. 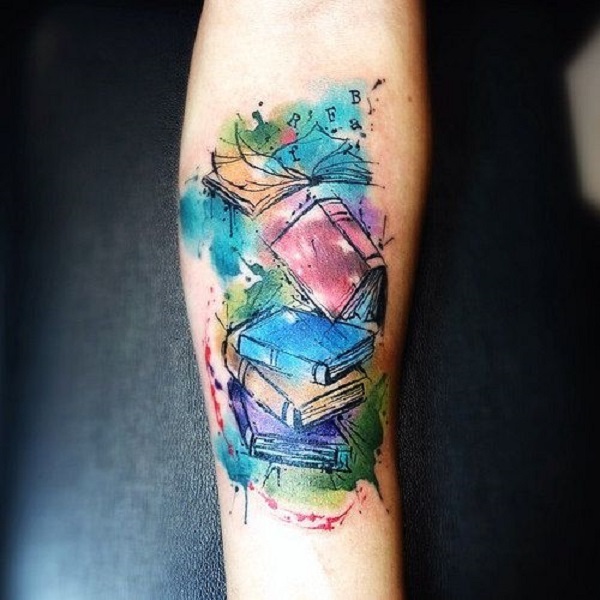 Colors on the arm when combined with the books make a great tattoo design to try. The Sprouting Plants Tattoo. The Sprouting plants tattoo from the book is the one that needs a shot. The Treasure of Words. Every perso9n has his story. If you want to tell your story to your world, this tattoo with the treasure of words combined with the open book is great to try. The Birds and Books. 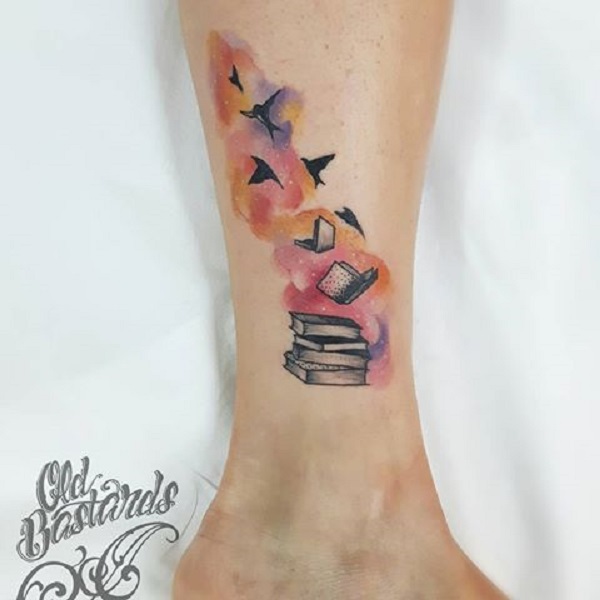 The birds and books when combined with the wonderful play of colors makes an enchanting tattoo design for all the tattoo lovers. The diamond shaped Book Design. 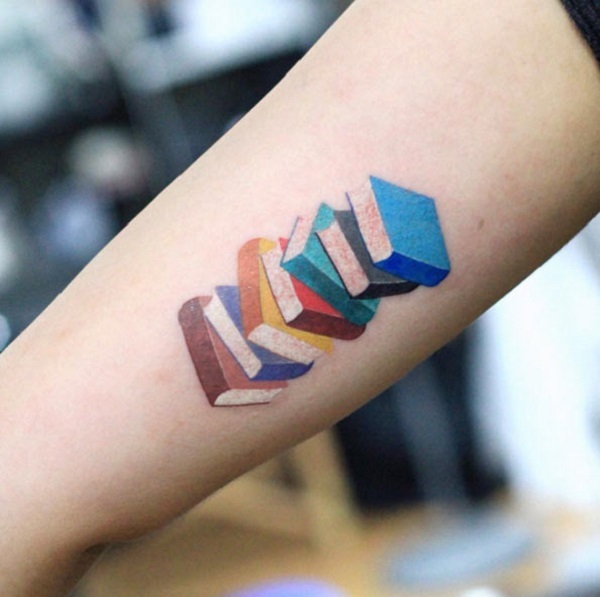 If you are looking for something geometric and colorful, this diamond shaped book design tattoo can work. The Celestial Work. If you admire the celestial work, then having this tattoo won’t make a bad decision. This colorful Arm Piece. 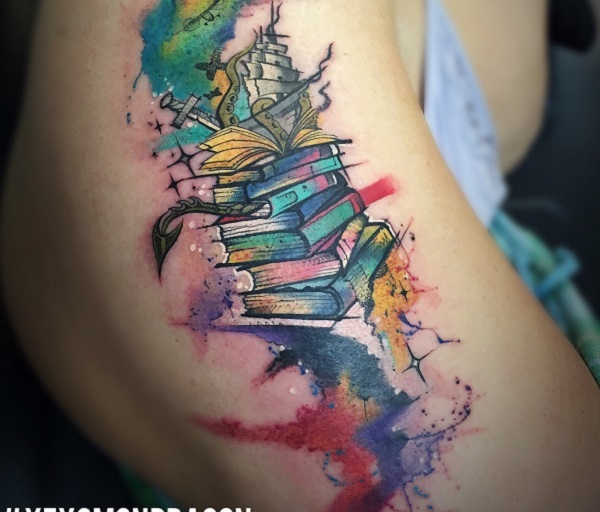 The books with the amazing art of colors is another worth considering option for the book tattoo design. The behind the ear books. The colorful behind the ear books is an inspiration, if you are looking to have book tattoo engraved on your body. Immortal Lady Reading Books. If you also want to be immortal with the power of knowledge, this tattoo is great to consider. A Simple Book Tattoo Design. Simplicity is the beauty. This thing is rightly explained in the tattoo design above. Attitude Book Tattoo Design. “I am my own person and I will not set the fire to myself to keep you warm” quote on the book is for you. The Books of Music. Music, Books and Birds. All in the single piece of art is love. The Open Book. An open book symbolizes tons of meanings, so this tattoo. Gray Scaled Books tattoo on the Back. This tattoo design is for all the reading ladies, who love to read. Books with Apple. 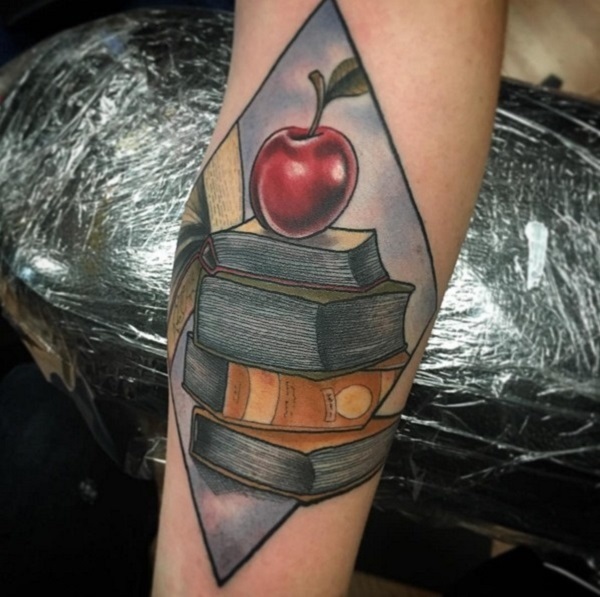 The grey and skin books coupled with the red big apple is another amazing book tattoo design inspiration for all those book worms. These adorable book tattoo designs are for all those bibliophiles who still find joy in the books!